All Sports Community Service's New Friends for Life program was created to awaken the social consciousness of the pro athlete and the business community to the needs of challenged yet deserving students. These students wished to achieve their dreams of attending and graduating from college, then returning to help the next cohort of students. The act of creating a new friendship would begin an ongoing cycle of success as each new generation achieved, then turned back to help another succeed. All Sports moves with the students from year to year through college admission, graduation, and professional career. All Sports also moves with the professional athletes from team to team so that they are always informed about the lives of the students they befriended. All Sports would like to thank the Buccaneers organization and the players for being dream-makers, not only for one generation but onward into the future. The John Lynch Foundation received notification that it will receive an NFL Charities Player Organization Grant for the 2009 year. The John Lynch Foundation received notification that it will receive an NFL Charities Player Organization Grant for the 2009 year. Funding will go towards the Foundation's youth programs, including the Star of the Month program, the Salute the Stars program and the Lynch Family Legacy Scholarships. 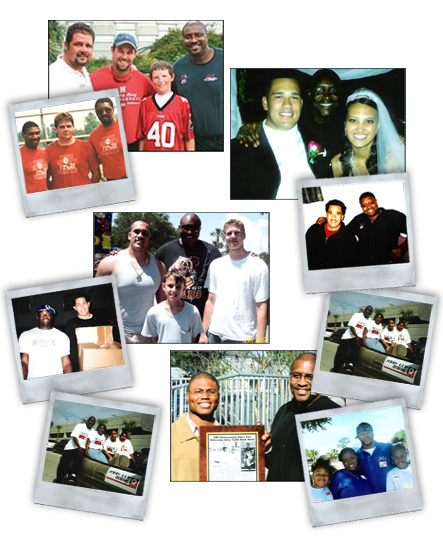 The Foundation has received a grant from the NFL on an annual basis since 2000. NFL Commissioner also personally recognized John and the Foundation for its ongoing efforts. A basketball scholarship brought T.J. Lewis ’97 to Queens, where he captained the first men’s team in university history to make the NCAA tournament. Just 16 years later, he and his wife Charmain Pugh Lewis ’98 have made a major gift to name the Lewis Men’s Basketball Locker Room in the Levine Center for Wellness and Recreation. T.J. credits his Queens education as a major factor in his successful career in financial services, and now he and Charmain want to help ensure that other students have the same transformational experiences at Queens as they did. “Queens builds leaders,” T.J. asserts, explaining that in an environment where leadership is encouraged, students can create their own experiences. Both of the Lewises rose to the challenge during their Queens years. Charmain started a student fashion show, and T.J. secured summer internships at Bank of America that ultimately led to his first job after graduation. After 13 years with the bank, he took a job three years ago with Urban Lending Solutions as an executive in corporate diversity and business development. After several successful years in Bank of America’s commercial lending and consumer real estate divisions, McColl asked T.J. to join Queens’ Board of Trustees. That’s where he was first able to express his strong support of athletic programs at Queens. “My experience playing basketball at Queens had a huge impact on my life. To this day, the memories of making the NCAA tournament give me chills. It was a great ride,” he says. He and Charmain are happy they are able to contribute to the next generation of athletics at Queens.